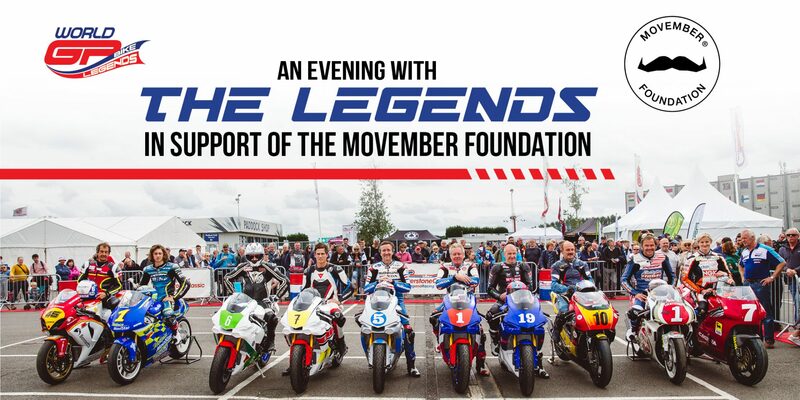 World GP Bike Legends once again took part in the world-renowned Silverstone Classic event for the 4th year in 2018, with the event culminating in a gala dinner near the Silverstone Circuit in support of the Movember Foundation UK. Men’s health and charitable works are something that are important to the Legends, and this year we had the opportunity to team up with Movember UK to raise awareness of prostate cancer, testicular cancer, mental health and suicide prevention in men. Movember aim to have an everlasting impact on men’s health and because they are funded independently from the UK government they can act faster and invest in new initiatives ahead of the curve; a sentiment World GP Bike Legends are happy to support and stand alongside. World GP Bike Legends were joined at the event by our Legends riders: Wayne Gardner, Freddie Spencer, Dider de Radigues, Niggi Schmassmann, Raymond Roche, Christian Sarron, Phil Read, Maria Costello and the inimitable Steve ‘Stavros’ Parrish. True to form, joker Steve was on hand to provide some entertainment for fans who had joined the dinner travelling from all parts of the UK. The Legends riders had pictures on hand of their glory days in racing and fans had the chance to ask the questions they have always wanted the answer to. After some fabulous food and obligatory glass of wine, the Legends were far happier to answer the tell all questions – providing there were no recording devices, or course! The World GP Bike Legends and riders had donated to the auction which raised funds for Movember on the night, while all the riders were keen to raise the profile of such an important cause.